As I mentioned in a previous post or two, I joined the multi-box break over at Nachos Grande (http://fanofreds.blogspot.com). I chose the Mariners since I was a late-comer to the party and the Tribe were long accounted for. 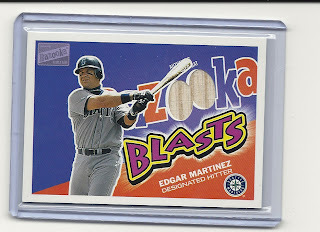 I contemplated the remaining teams and the approximate date of the boxes being opened and figured the Mariners would be a good bet, probably scoring a few Ichiro and Griffey Jr cards. Well, turns out I was right to a certain degree. 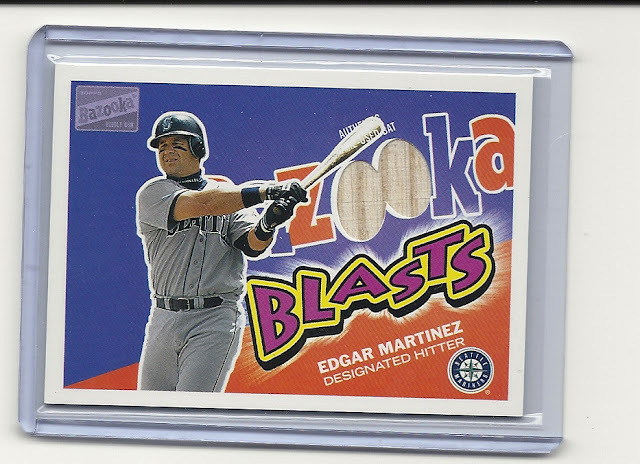 Though this Bazooka was the only "mojo" in the Mariners section of the break, I ran away with 41 base cards and 15 inserts! 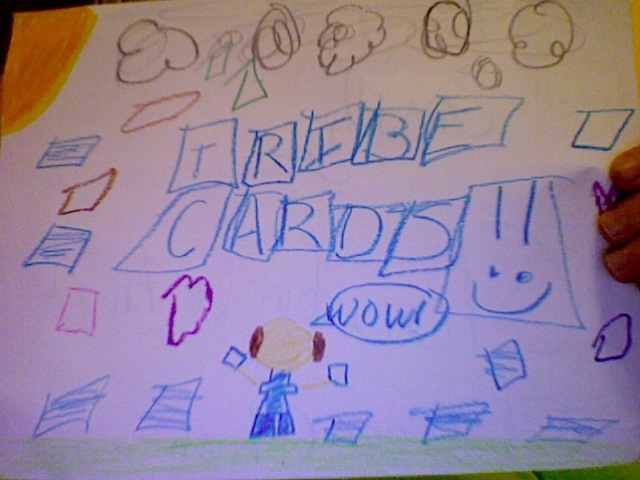 As mentioned in my post of the cards WhiteSoxCards sent me, Mr. Peterson (aka PunkRockPaint) also sent me a package that was truly packed with Tribecards. Let's talk about the "mojo" factor, since this next stack (er, I hope, since I am typing this without knowing which images are really being shown where as I write) has a couple worth noting: Fleer Showcase Sticks Game-Used Bat from Roberto Alomar, Fleer Premium International Pride Game-worn jersey of Ivan Gonzalez. 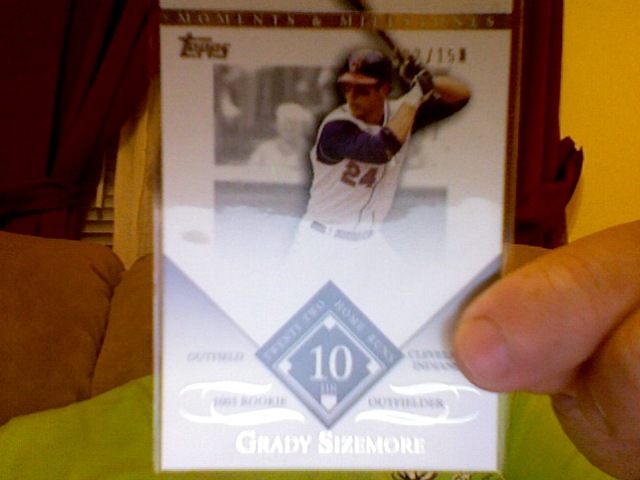 Other stacks have serially numbered cards, limited parallels, etc. How about die-cuts, autographs, and such? SP Marquee Matchups, Donruss X-Ponential Power, UD PowerDeck CD, Pacific Christmas Ornament, Fleer E-XL Legion of Boom, Fleer eX E-Xciting, UD UR2K Blue 2353/3500, UD UR2K silver 150/250, UD Authentic Memorabilia Game-Used CC Sabathia Jersey, Bowman Signs of the Future Trevor Crowe and Adam Miller. A great mix of unique cards! And how about some of the greatest names to have donned a Tribe uniform? Jim Thome, David Justice, Bartolo Colon, Manny Ramirez, Omar Vizquel, Early Wynn, Leon Wagner, Lou Boudreau, Bob Feller, Stan Coveleski, Kerry Wood, Tris Speaker, Joe Carter, Larry Doby, Travis Hafner, Grady Sizemore, and more! There are GREAT cards in here!! I can't tell you how much I appreciate this package of cardboard collectible goodness!! 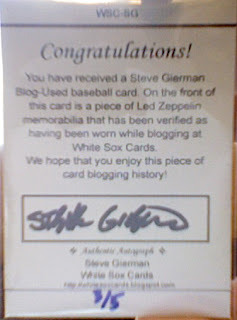 This week's mojo is an extension of last week's in that it also comes from Steve over at WhiteSoxCards! I don't know what constitutes 'mojo' for most folks, but for me, it means anything that is game-used, autographed or serially numbered. Sometimes, if the card is the only one in a subset/parallel, then that could be considered pretty mojo-esque as well. Well, since today is "42 Day" (that is, 10/10/10 in binary being 101010 which translates to 42 in decimal), I thought it would be fun to look up some stats related to 1,010. And here they are for your "enjoyment:"
Roberto Hernandez pitched in 1,010 games in his career. Woody Fryman gave up 1,010 earned runs during his career. In 1931, Carl Hubbard had 1,010 BFP's (Batters Faced by Pitcher). In 1987, Mike Scott had 1,010 BFP's. Jim O'Rourke had 1,010 RBI's in his career. In 1974, Don Gullet had 1,010 BFP's. Frank Baumholtz had 1,010 hits in his career. Jim Lemon batted in 1,010 games in his career. In 1997, Jeff Fassero faced 1,010 batters. In 1983, Shane Rawley had 1,010 BFPs. In 1963, Jim Maloney had 1,010 BFPs. Jimmy Key gave up 1,010 earned runs in his career. In 1983, Tommy John faced 1,010 batters. John Smoltz committed 1,010 base-on-balls in his career. 1994, Mark Grace had 1,010 Total Chances (TCs). Willie McGee score 1,010 runs in his career. In 1963, Tim Harkness had 1,010 total chances. Al Leiter gave up 1010 earned runs during his career. In 1982, Ray Knight had 1010 total chances. As of 10/10/10, Aaron Rowand had 1010 games started in his career. Bernie Carbo batted in 1010 games. Al Fitzmorris face 1010 batters in 1975. Dave Pagan faced 1010 batters in his career. Alan Ashby had 1010 hits throughout his career. In 2002, Brad Asmus had 1010 total chances. Ed Sprague had 1010 hits in his career. Randy Milligan had 1010 CHs in 1991. Ted Abernathy recorded 1010 holds in his career. In 1973, the California Angels had 1010 Strikeouts total. As of 10/10/10, Adam Dunn had batted in 1010 games. Eric Hillman had 1010 BFPs in his career. Geronimo Pena had 1010 at-bats during his career. Joe McClain had 1010 BFPs in his career. Steve Renko walked 1010 batters on balls throughout his career. Cy Barger recorded 1010 Holds throughout this career. Woody Williams had 1010 assists in his career. Through 2007, the Reds had lost 1,010 times against the Dodgers. *Note all these stats are from www.Baseball-Almanac.com, and were posted on that site as of 10/10/10. 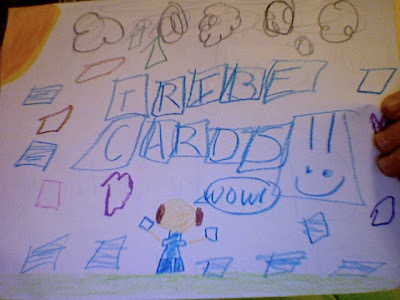 The Tribecards Turfdiggers (much like the boys from the 'burgh) suffered their first loss of the season, falling to 3-1-0 after getting beaten by the other undefeated team, The Red Grange Halls. The Turfdiggers scored 68.94 points this week. The Halls scored 74.92. The difference is just 5.98 points. How big of a deal is that? If the Turfdiggers had put in Cooley (Was - TE), they would currently hold the only undefeated seat in the league. Cooley scored 7.85 points on Sunday. Instead, the Turfdiggers held on to Hines Ward (Pit) (.70 points) and Santana Moss (Was) (.25 points). The decision not to play Cooley was a tough one. I figured Moss was going to be a no-brainer while Ward was a tougher decision. I knew he would not get many touches since the Steelers were too busy running the ball (thus Mendenhall's great season thus far), but I figured he would get more since Big Ben would be heading up the next Steelers game. It's a critical error that booted me out of the top spot. Overall, the points separation is tight. Only 11.11 points keep the Halls and Turfdiggers apart (well, and the fact that the Halls are undefeated). When we look at the 3rd and 4th place battle, the Florida Vikings trail the East TN Roadkill by just 5.78 points. The Vikings have a better record (coming UP to the same 3-1-0 record as the Turfdiggers), and thus hold the third place slot after Week Four. I had planned to pick up Ben after the games on Sunday and forgot! Instead, the Roadkill snagged him up. Since I have Manning, I wasn't necessarily going to play Ben, butmainly keep anyone else from getting him. Ooops. Ah well. Looking ahead, the Turfdiggers face the Vikings in Week 5. Once again, we have a "one must fall" situation. The Steelers have a BYE in Week 5, so this will be a nailbiter for the Turfdiggers. According to the Yahoo! match-up, it is going to be a close game for the 'diggers and the Vikings. Let's hope I can pull off a win! Or did week four begin the annual descent into fantasy football oblivion? 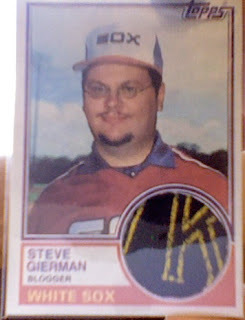 You may recall, about a week ago I received a package from Steve over at WhiteSoxCards. Well, one of the items included was the #/5 limited custom blog-worn jersey card! Wahoo!! I got 3/5, and I have to say, this thing is very cool! Sorry for the bad pic, but the lighting in my living room doesn't fair too well for Photo Booth on my MacBook. Nonetheless, as you can see this card ROCKS! And, since it has a blog-worn jersey cut from a Led Zeppelin shirt, it REALLY ROCKS!! Man, this a great gift!! It's even an autographed, blog-worn card! Thanks a TON, Steve!! In the "Card Collector's" league, the consolation games are over, and the Bums and wRappers ended up tied, splitting the score 5/5. 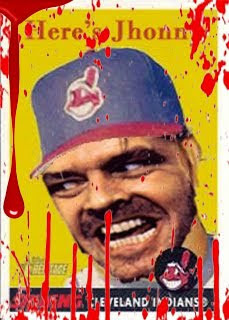 Favor goes to the Bums, however, so they took 7th place and the Tribecards wRappers end the season in 8th place. While this might sadden, frustrate or even anger other managers, I am happy just not to be in last place this year (as I have been in the past). If invited next season, I hope the wRappers will continue to show improvement. The major difference this season was NOT picking only/mainly Indians players for the fantasy team. While it may seem against the general idea of who I like to root for, the simple fact is that variety is the key. Well, that and picking the right players to begin with. I'll work on that for next year. In the meantime, congrats to the Aniballers for winning the whole shebang!